Dynamic organizations want to accelerate growth while reducing costs. To do so, they must speed the deployment of business applications and adapt quickly to any changes in priorities. Organizations today require an IT infrastructure that is easy, efficient, and versatile. The VersaStack solution by Cisco and IBM® can help you accelerate the deployment of your data centers. It reduces costs by more efficiently managing information and resources while maintaining your ability to adapt to business change. The VersaStack solution combines the innovation of Cisco UCS Integrated Infrastructure with the efficiency of the IBM Storwize® storage system. The Cisco UCS Integrated Infrastructure includes the Cisco Unified Computing System (Cisco UCS), Cisco Nexus and Cisco MDS switches, and Cisco UCS Director. The IBM FlashSystem® V9000 enhances virtual environments with its Data Virtualization, IBM Real-time Compression™, and IBM Easy Tier® features. These features deliver extraordinary levels of performance and efficiency. The VersaStack solution is Cisco Application Centric Infrastructure (ACI) ready. Your IT team can build, deploy, secure, and maintain applications through a more agile framework. Cisco Intercloud Fabric capabilities help enable the creation of open and highly secure solutions for the hybrid cloud. These solutions accelerate your IT transformation while delivering dramatic improvements in operational efficiency and simplicity. Cisco and IBM are global leaders in the IT industry. The VersaStack solution gives you the opportunity to take advantage of integrated infrastructure solutions that are targeted at enterprise applications, analytics, and cloud solutions. The VersaStack solution is backed by Cisco Validated Designs (CVD) to provide faster delivery of applications, greater IT efficiency, and less risk. 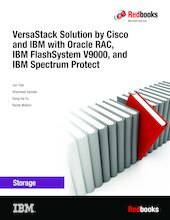 This IBM Redbooks® publication is aimed at experienced storage administrators who are tasked with deploying a VersaStack solution with Oracle Real Application Clusters (RAC) and IBM Spectrum™ Protect.